1874 Advertising poster for Pacific Mail Steamship Company service in southern California. Credit UC Berkeley Bancroft Library. Steamship arrivals to the port of San Diego were a common topic in the city’s newspapers in the late 19th century. I’ve also found that a number of historical personalities in San Diego history first arrived here and/or subsequently traveled on one particular steamship, the Orizaba. My curiosity was triggered. 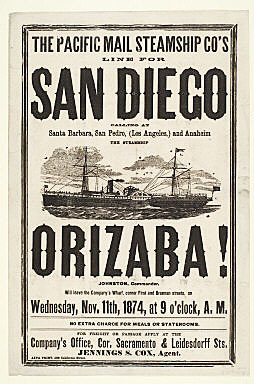 As I started digging I discovered that a lot of people sailed to or from San Diego on the Orizaba, which plied the waters between San Diego and San Francisco, with some stops in between, from 1865 to 1887 for the Pacific Mail Steamship Company. Keep in mind that there were fewer than a thousand people living in the city of San Diego when the Orizaba first arrived here in December, 1865. The railroad wouldn’t arrive until 1885. So overland or over the sea were the only ways to transport people and freight to or from here. In 1865 the Orizaba was a state-of-the-art workhorse of the sea, a wooden side-wheeled steamer of 1,244 tons, 246 feet long, 35 feet wide 15 feet high from her top deck down to her keel. She made the run to San Francisco in three days and, with layovers at each end, made port in San Diego every 12 days. That comes out to roughly 528 trips over 22 years. Sources for this post included historic San Diego newspapers and The Journal of San Diego History.